According to Twitter user statistics, 6,000 tweets are sent every second, adding up to 500 million tweets per day. That’s a lot of photos, links and videos to go through and just from one social network. There’s no question that we’re bombarded with lots of information every minute of our online presence which in turn makes it difficult not only to find good content but also to stand out when sharing content with your followers. But, how can we weed through information overload to offer our audience quality content? On this post, we will go over an interesting option: Content Hubs. 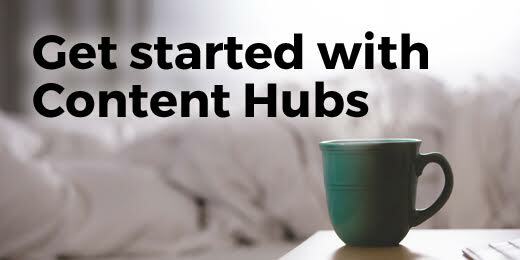 Haven’t heard of Content Hubs before? Some time ago, we had a 2 part conversation about Content Hubs on our #BizHeroes chat (Part I, Part II). There were some great tips and tricks on getting started. Let’s review what we learned about Content Hubs and how they can help businesses and solopreneurs. In a nutshell, a content hub is a structured and organized section on your website or blog that presents a variety of content on a specific topic. Our guest for Part II of our Content Hubs chat, Jade Phillips (who wrote an awesome post you can find here!) explained that “content hubs centralise content from several sources. They pull content into a neat presentation with context!”. Context is the keyword here. When building a Content Hub, you have to know who you’re targeting, what you’re offering and why you’re doing it. What type of content should go on a Content Hub? If you have your audience and community in mind, then a content hub could help you in many ways. A great idea is to use a hub to share and promote your community rockstars. Always keep in mind the importance of offering value by keeping your followers informed. Why should I create a Content Hub? This post wouldn’t be complete without a good list of tools you can use to make a nifty Content Hub! So, let’s recap what our #BizHeroes suggested. And of course, we can’t leave out our favorite (we’re biased! ): Paper.li! If you want to check out some great examples of Content Hubs created with Paper.li, then head over to this post. Have a content hub? We’d love to see it! Tweet it to us @paper_li or comment it below. What do you think about Content Hubs? Let us know in the comments!